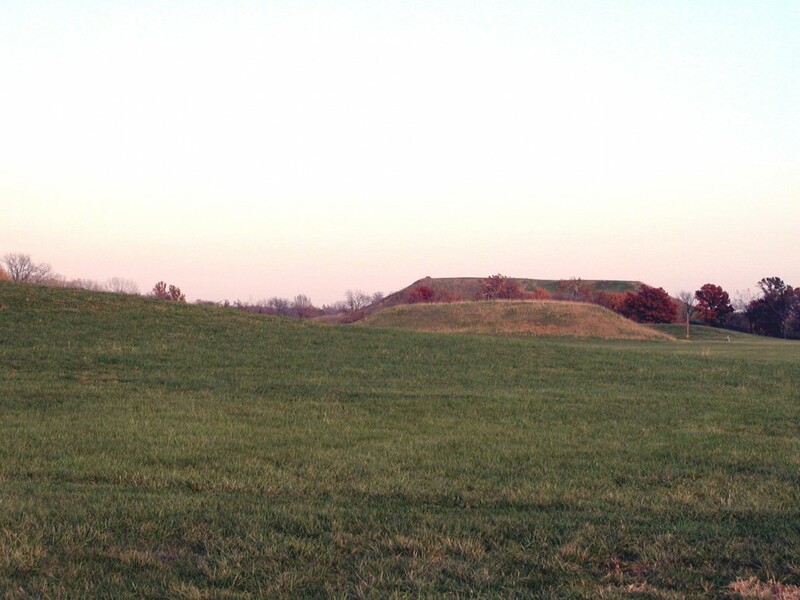 Known as the Merrell Mound, this is one of the largest and best preserved mounds in the entire archaeological zone. It is also unique because an oval platform mound is built on its southwest corner. According to Bushnell, this secondary mound was an elevated platform about 75 feet (22.9 meters) in diameter. The main Mound 42 is a rectangular platform approximately 79 meters by 122 meters (260 feet by 400 feet), based upon the UWM Map. The Patrick Map shows a north-south dimension of 240 feet (73.15 meters) and an east west dimension of 280 feet (85.3 meters). The various height estimates are fairly consistent, ranging from 25 to 30 feet (7.6 to 9.1 meters) above the surrounding flood plain. The UWM Map confirms these estimates. The Merrell Mound had not yet been excavated in Moorehead’s time. In 1969, Elizabeth Benchley, of the University of Wisconsin-Milwaukee, conducted some test excavations in the southwest corner of the Merrell Mound to examine the nature of the oval platform mound that had been constructed on top of the larger mound.